This review is for a product that I don’t think will appeal to all baritonists, but it is certainly a unique product and not something seen before so worth checking out. Many, if not most baritonists these days, use a harness or at the very least a neck strap that provides a lot of support. Neck straps and harnesses have come a long way in the last 10 years, with many new options and systems out there. For some people though these aren’t an option due to extreme back issues or other problems. 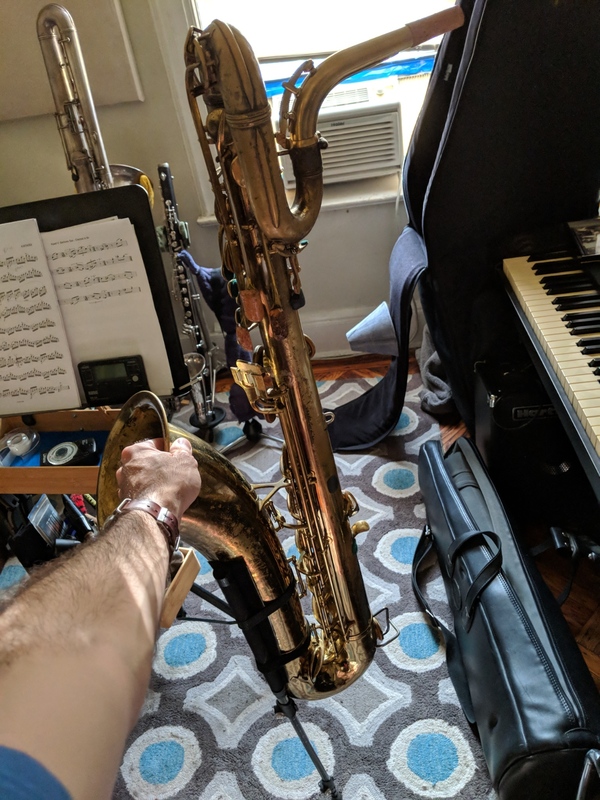 There are a few modern baritone saxophones that include an integrated peg (similar to bass clarinets), although none of the major or popular brands do. In the past baritonists that didn’t want to use a neck strap could get a Hamilton style stand with a part that sort of bolted to the mid bell section of the horn that could be taken on and off a sturdy stand, and more importantly adjusted so it could be played while sitting without any weight being on the player. A new product from Australia offers a new option for the players out there that are looking for an alternative to neck straps or are unable to use them. 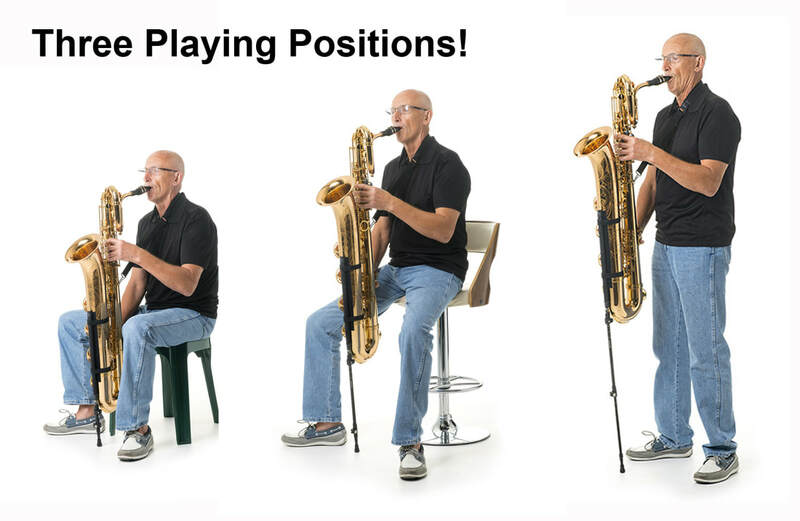 The SaxSupport sax stand is a light-weight telescoping stand made to hold the weight of the saxophone in a similar way to a bass clarinet peg would. The stand reminds me very much of a monopod camera stand, similar type latches with multi-tired adjust-ability. The materials seems to be high grade sturdy plastic with some metal hardware in the important places. The locks have a ‘cam-lock’ system with adjustable screws to adjust tension. The pole also has numerical markings to get the same precise length desired for different situations (sitting vs standing). A nice rubber bottom of the ‘peg’ keeps the stand from sliding too much. The top portion of the stand is covered in a rough velcro – this is the area that is made to connect to the horn. The main issue I have with the stand and I think what will cause many people to hesitate is the manner in which the stand connects to the horn. Included with the stand are two narrower strips of velcro and one long wide strip with an adhesive on the back. The wide strip of velcro is made to be placed vertically on the bow/bell portion of the saxophone. The SaxSupport stand velcro will adhere to this strip and the two narrower strips of velcro are made to go around the bell and be tightened similar to horizontal belts. When testing out the stand I did not use the glue back to adhere the wide strip to my horn. 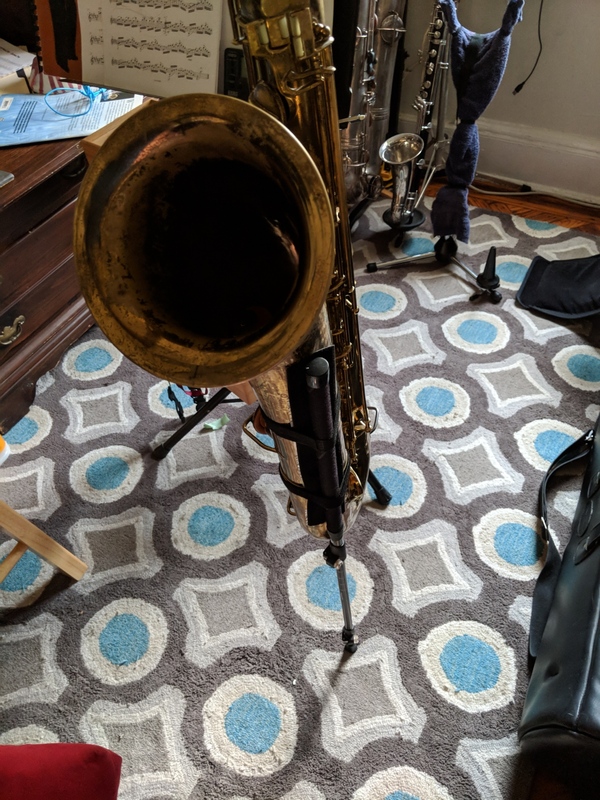 I was concerned with applying and adhesive strip and removing it on my horn and whether that would damage the lacquer, especially as the lacquer on my vintage horn is already missing in places. The maker of the stand could not provide exact details about the type of adhesive used in the backing. However he does provide pictures on his website of having removed the velcro after a year on his horn. With some glue removal solution it looks like there were no permanent marks. I imagine more modern horns with complete lacquer will be less at risk, but I think anytime you are attaching something to your horn, especially when using it to hold the horn you can expect some abrasion or permanent marking. 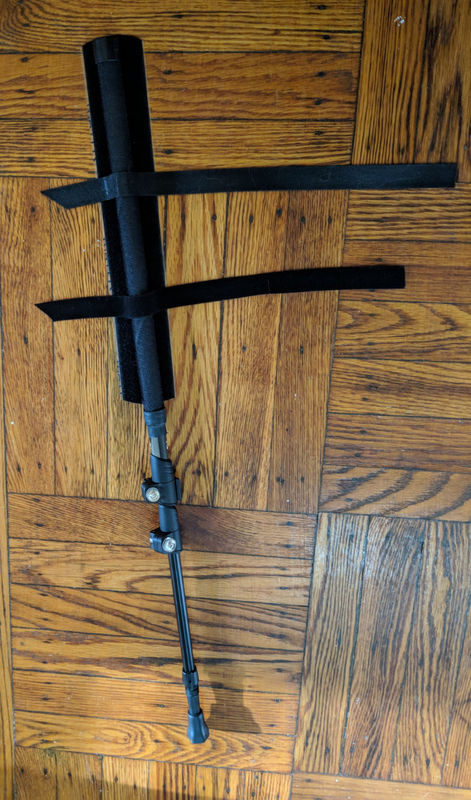 I was able to get the stand to hold the weight of the horn with a simple friction fit, using the velcro and the two thin strips very tightly clasped around the bell and the stand. It adjusted nicely, and while it felt a little strange as it was a different playing angle, it could certainly be adapted to. The maker of the stand recommends using a neck strap or harness in addition to the stand and I think that’s a wise precaution. One additional consideration is that the shape of the bell and bow on a Low A baritone is quite different than that of a low Bb baritone, especially a Conn like my own. The low Bb bells can be curved almost the majority of the bell, whereas low A horns have a much longer section that is pretty much straight. 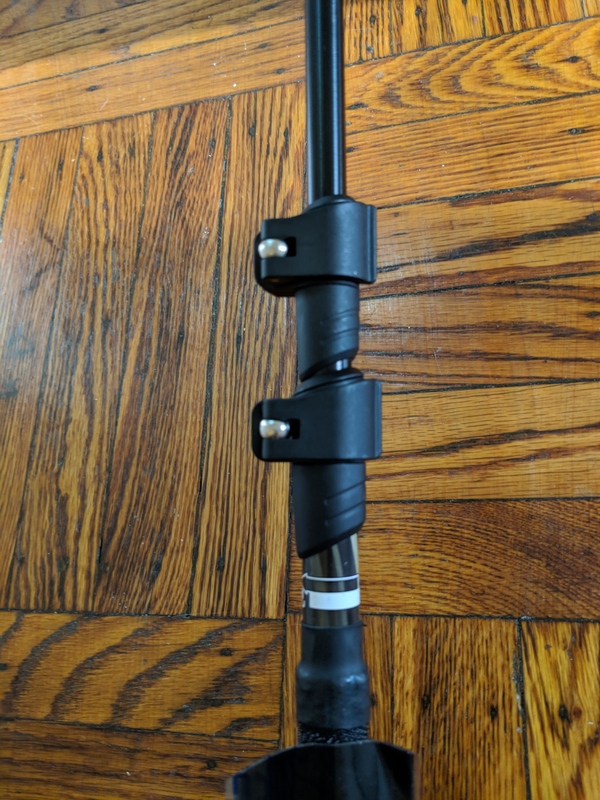 This makes the SaxSupport stand much more compatible with a low A horn rather than a low Bb horn, though by experimenting with placement I think you could still make the system work. My honest perception of this product is that I don’t think most players really need it, or will be willing to adhere/glue a velcro strip to their horn to use it. However, for the few people that really can’t use a neckstrap or harness this product could be the difference between never playing the baritone again or continuing to enjoy the king of all horns. Aside from the issues I have with the connection to the horn and bell the stand seems very well designed and thought out. It should be noted that this stand could theoretically be used for any of the saxophones. The SaxSupport stand is $89. You can order one and see all of the details over at the website. Finally, a Harry Carney transcription!